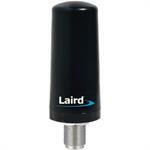 Laird Technologies’ unique Phantom® antenna operates simultaneously in the 698-960 MHz and 1700-2700 MHz bands, making it ideal for 4G/3G applications. The mechanically robust design is suitable for both indoor and outdoor applications with wide bandwidth and a low angle radiation pattern that is superior to traditional gain antennas in most applications. The antenna is ideal for both ceiling and surface mount applications. The industry standard NMO mounting socket mates with all Laird Technologies’ magnetic, trunk lid and hole mount configurations. A threaded permanent stud mount model is also available for vandal resistant mounting on brackets, panels, ceilings or any other kind of housing.